For me the real find is this beautiful Polish sausage. Of course the Bison pastrami sounds pretty fantastic as well. Worth checking out! 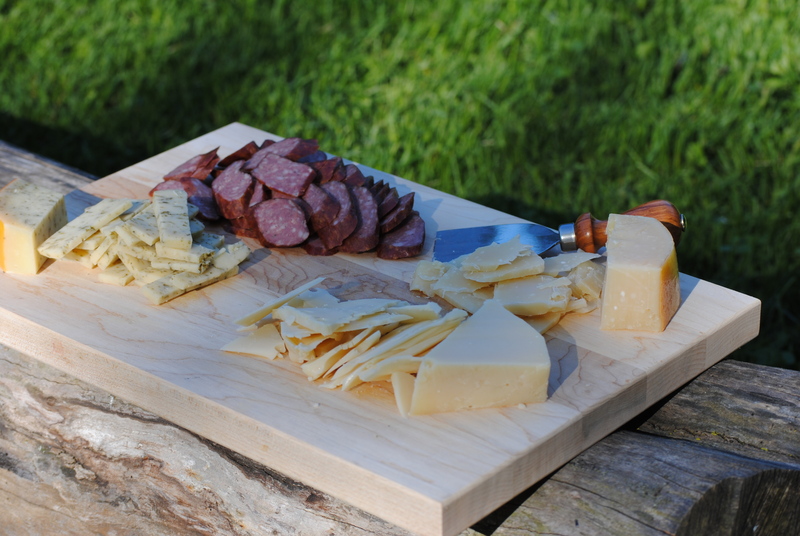 Cheese production is one of the great traditions of Great Lakes Cuisine. The immense amount of factory produced cheese from the “Dairy State” is merely an outgrowth of a much older tradition of farmer produced cheeses. Cheese at the most basic level is a method to preserve milk and this preservation tradition is very much at the heart of Great Lakes Cuisine. There is large and growing number of excellent farm-based and artisan producers through out the Great Lakes region that deserve attention and praise. Today I’ll highlight just two: Holland’s Family Cheese and the McCluskey Brothers, each highlighting the tradition of cheese production in different ways. Holland’s Family Cheese recently was recognized as the 2013 Grand Champion of the U.S. Championship Cheese Contest. Not simply the best in their category, but the best overall cheese, period. I’ve long been a fan of the European-style Gouda that is produced by Marieke Penterman, with a pronounced nutty flavor and great mouth feel. As I understand their family story, they immigrated to the U.S. and specifically to Wisconsin in order to establish a family farm, as land was not as readily available in the The Netherlands. Marieke brought the old-world cheese making tradition to her new home. All the cheese they produce is from the milk of their own cows, and as a farmstead cheese, it retains all the uniqueness of their location. It is the ongoing food tradition of the Great Lakes in full, glorious flavor. Immigrant produced from local resources to meet local demand. Featured here (clockwise from right edge) are Mareieke super-aged, semi-soft, and honey clover infused Gouda. 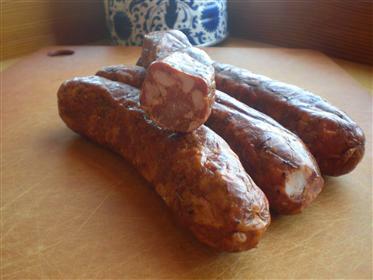 We enjoyed them with Zuber’s landjaeger sausage from Monroe, WI. McCluskey Brothers is a more recent discovery for me, but the longer of the two traditions. Their great-grandfather began the farm in 1886 and they have been producing and selling the bounty from that farm since then. Their grass-fed cheddar purchased this spring is the perfect example of what cheddar once was and should always be. The color is slightly off-white, tending towards a golden tan. The flavor is full, complex, grassy, and wonderful. All their items are organic and farmstead produced. The color requires a quick history of Wisconsin cheddar for those unfamiliar. Producers in the 1800’s shipped nearly all their cheese to England, and the English buyers graded the cheeses by color. The darker gold were more valuable. There is some debate if this pricing was to reflect a preference for naturally grass raised milk (as that naturally produces a more golden color, particularly as it ages) or driven by local preference for cheddar from Cheshire, which reportedly had grass with a higher iron content that reflected in a mildly orange tint to the cheese. Regardless, the producers began to add annatto to game the system. I would love to see all cheddar return to the naturally colored, and grass-fed, product as the orange color now obscures the true color of the cheese. The golden yellow of McCluskey Brothers’ cheddar hints at the origin of the milk, the grassy flavors, and the transformation of sunshine into food. This tradition represents the same immigrant driven production but adds the generational layers that allow cuisine to develop a unique identity attached to place. These are both part of the tradition that make Great Lakes Cuisine what it is: farmers committed to producing good food at a good value for people who like to eat. Seek out their cheese, maybe add a Pleasant Ridge Reserve from Uplands Cheese (another incredible, award-winning, artisan, farmstead cheese) to make a really compelling cow’s-milk cheese plate. I’d recommend adding a nice dried sausage, some dried cranberries, and a selection of malty, amber craft brews and making a tasting out of it. Enjoy.